The investigation into the alleged global warming data fraud by Virginia’s Attorney General may soon have a whole new angle. This comes from a previously overlooked connection between discredited tree-ring proxy researcher, Michael Mann and Yale’s now deceased climate professor, Barry Saltzman. Despite his legacy, outside of climate science few people will have heard of Saltzman. It was only right at the end of his 40-year career that this esteemed analyst produced his greatest achievement: a unified theory of climate that drew worldwide plaudits. The American Meteorological Society (AMS) and Journal of Climate among others posthumously gave Saltzman the ultimate accolade, “father of modern climate theory” on the publication of his ground breaking ‘Theory of Climate’ (2002). As Professor of Geophysics, Saltzman served Yale University with distinction from 1968 until his death in 2001. Michael E. Mann’s position in the highly politicized sphere of climatology has since grown to be just as significant-but far more controversial. But we may have stumbled upon a sinister connection between the two researchers. It did: the UN’s Intergovernmental Panel on Climate Change took Saltzman’s unified theory and used it in subsequent Reports as the template to blame the fossil fuel emissions of western nations for changing Earth’s climate. The “gap” stayed bridged-at least until Climategate when Saltzman’s neat and tidy theory began to unravel. An unsuspecting world merely had to read the leaked emails to see how the Emperor’s Climate Clothes were crudely stitched together by heady tribalism among opportunist cronies. Tree-ring expert Michael Mann had simply picked up Saltzman's thread. Mann’s highly dramatic ‘hockey stick’ graph was to dress the scene very nicely for the launch of the 2001 Third Report of the Intergovernmental Panel on Climate Change (IPCC). Overnight Mann re-wrote the paleoclimatic record to the astonishment of solar physicists, geologists and historians worldwide. But the deeper we dig the more we uproot our so-called tree-ring expert. In Mann’s lavish 13,465-word online résumé the word ‘tree’ appears only 6 times. By comparison the word ‘ocean’ appears 37 times. Even his doctoral dissertation makes not one reference to trees-its all about oceans. Clearly, our Michael is not a Mann enamored by tree ring research. It’s in 1996 that this story gets very curious. At that time Mann needed help to “defend” his Ph.D work in a documented but unexplained controversy at Yale. Inexplicably, this ‘controversy’ was peremptorily swept aside and between 1996-98 Mann was named as the Alexander Hollaender Distinguished Postdoctoral Research Fellow (DOE). "So what miracle turned this problematic researcher’s life around? If miracles happened for Mann, they came in the form of Barry Saltzman. You see, this struggling student’s career was transformed the moment Saltzman became his Ph.D adviser. 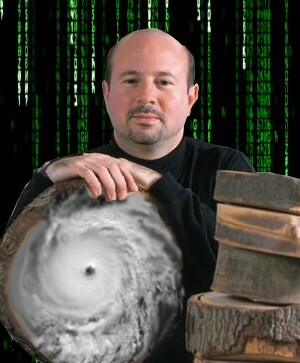 Only after Saltzman applied his influence were Mann’s lofty credentials “rushed through.” Mann then turned himself into a makeshift tree ring counter, and overnight became the iconic figure in the IPCC Third Report (2001). The rest is history, as they say." If my name were Ken Cuccinelli I would want to chase down one or two grant and funding sources; with proof of collusion a case for fraud holds water. That's treble damages and Virginia’s taxpayers will be sitting $1.5 million better off plus expenses.